The pleasure of a moisturizing lotion with energizing benefits. Enriched with soothing organic aloe vera and shea butter, raspberry and peppermint, this body lotion is a sparkling cocktail of energy and freshness. Botanical-based ingredients: Organic and fair trade Shea butter, Aloe vera gel from Organic Farming, Peppermint essential oil (in the fragrance) and a Raspberry extract. Explore the entire range of Lotions & Creams available on Nykaa. 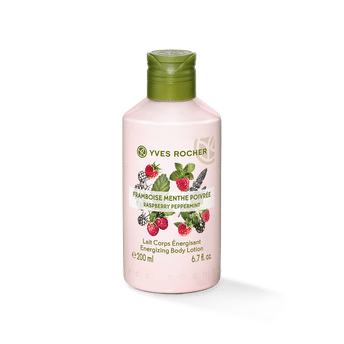 Shop more Yves Rocher products here.You can browse through the complete world of Yves Rocher Lotions & Creams .Alternatively, you can also find many more products from the Yves Rocher Energizing Body Lotion - Raspberry Peppermint range.